Jewish history in the 20th century is full of might-have-beens, most of them too sorrowful to bear thinking about. The brief cultural moment that Kenneth B. Moss resurrects in Jewish Renaissance in the Russian Revolution (Harvard University Press) is one of the least known and most fascinating of those aborted futures: a two-year period when writers, artists, and activists in Russia and Ukraine believed they were midwiving the birth of a new Jewish culture. Drawing on little-known sources in Russian, Hebrew, and Yiddish, Moss brilliantly anatomizes the institutions and ideas that flourished in that tumultuous time, before the window of history slammed shut and the European Jewish future took a much different turn. The years 1917 to 1919 might not sound like an auspicious time for Russian Jews to be thinking about art and literature. The Czarist empire, devastated by the First World War, abruptly collapsed in February 1917, giving way to a short-lived liberal government and then, in November, to Lenin’s Bolshevik dictatorship. When the Communists sued for peace with Germany, they signed away much of the old Pale of Settlement, the swath of Eastern Europe where Russia’s Jews were legally compelled to live. Warsaw and Vilna, the intellectual capitals of Eastern European Jewry, were suddenly detached from Russian rule. Revolution and occupation then gave way to civil war, as the counter-revolutionary White armies tried to overthrow the new Red government, committing numerous atrocities against Jews along the way. But amidst all the dislocation, violence, hunger, and poverty, Moss shows, the idealists who had long been imagining a Jewish cultural rebirth saw a golden opportunity. These "culturists," as Moss calls them, were emboldened by the fall of the Czarist government, which had been fiercely anti-Semitic, and in the heady days of 1917 they saw a new freedom opening up. "All those questions which in the years before the war and the Russian Revolution seemed for the most part ‘matters undecidable until the days of the Messiah’ have now become questions of the moment that brook no delay," said the Hebrew writer Moshe Kleinman, in a passage Moss uses as the epigraph to his first chapter. Hillel Zlatopolsky, a wealthy businessman turned patron of Hebrew, and his daughter Shoshana Persits sent out a circular letter to Russia’s Hebrew writers, echoing that urgency: "Now all the external obstacles on the path of our work have been cleared away; now we can gather all our powers and organize them." As Moss shows, however, the internal obstacles to the Jewish cultural renaissance were equally formidable. In the decades before World War I, Eastern European Jews had grown highly politicized, turning to Zionism and socialism for solutions to their increasingly intolerable existence. But the division between Zionists, who looked to national rebirth in Palestine, and socialists, who wanted to radically transform life in the Diaspora, was intensely hostile, and it had important implications for culture. To the Zionists, the reinvention of Hebrew as a literary language was the key priority for Jewish culture; to the socialists of the Bund and other parties, it was Yiddish, the language actually spoken by Jewish workers, that must be the basis for Jewish civilization. Meanwhile, the majority of Jews were putting ideology aside and learning Russian or Polish, languages they could use for social and economic advancement. The debate between Hebraists and Yiddishists, then, had important political implications, and it became extraordinarily vehement. "In every locale, no matter how small," Moss writes, "two mutually opposed camps of Hebraists and Yiddishists emerged." And after the revolution, they formed rival national organizations. 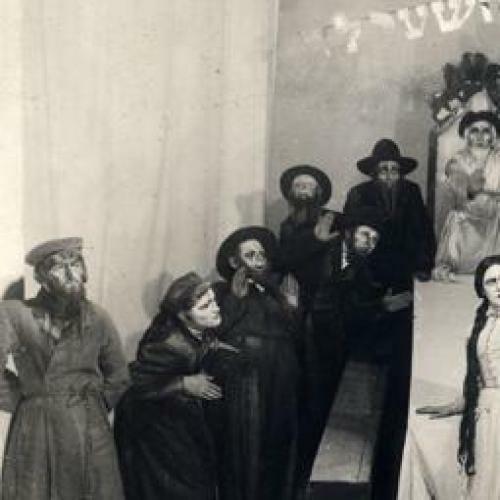 At a congress in Moscow in April 1917, 200 Hebrew "culturists" founded Tarbut (Culture); a year later, in Kiev, the Yiddishists founded the Kultur-Lige (Culture League). Within two years, the triumph of Bolshevism would mean that Tarbut was shut down completely and the Kultur-Lige was absorbed into the Communist party-state. But in their brief window of opportunity, Moss shows, Hebraists and Yiddishists accomplished a surprising amount. Both organizations supported schools for children and classes for adults, and promoted Jewish publishing houses, periodicals, and theater. Significantly, one of the main goals of each movement was to translate world literature into Jewish languages. The Hebrew publishing house Stybel launched a grand translation program, commissioning Hebrew versions of everyone from Pushkin to Zola to Oscar Wilde; the Folks-Farlag likewise prepared Yiddish translations of Tolstoy, Byron, and Maupassant. Such literary projects were no more likely to bring a profit in 1918 than they are in 2009, and Yiddishists and Hebraists alike relied on wealthy patrons to shield them from the imperatives of the market. The reason for focusing on translation, Moss shows, was ideological. Partisans of each language believed that the only way to create an independent Jewish cultural sphere was, paradoxically, to fill it with non-Jewish culture. The first generation of culturists had wanted Hebrew and Yiddish literature to reflect Jewish tradition and folkways; its great figures were writers like Chaim Nachman Bialik, who mined rabbinic literature for themes, and Mendele Mocher Sforim, who told stories of small-town Jewish life. The young writers of 1917 to 1919, however, wanted to broaden their horizons--to make Yiddish and Hebrew a national medium for universal culture, like any other language. Only if a Jewish aesthete could read Oscar Wilde in Hebrew would he have an incentive to keep reading and writing it; if Hebrew remained a parochial language, such a reader would drift into Russian or German, where he could feel like part of the European mainstream. That is why, when Stybel published its Hebrew Picture of Dorian Grey in 1918, the Hebrew literary journal Ha-Shiloah praised it as "the first complete Hebrew translation [of a] story which has no connection to Israel." The Yiddishist literary critic Moyshe Litvakov thought the same way: "Should the future and even present Yiddish writer cleave spiritually and psychically to this wonder-world of great [non-Jewish] artworks, if he should reforge them in the flame of his intuition, our literature’s ‘Pale of Settlement’ will perforce be abolished." Moss traces these complex literary debates with great skill. He is the rare kind of scholar who can both uncover obscure foreign-language sources and also effectively bring ideas to life. In fact, what comes across most clearly in Jewish Renaissance in the Russian Revolution is the intellectual idealism of the "culturists." As Moss repeatedly demonstrates, they always placed art above politics; even the most ardent Zionists and socialists refused to make culture simply a vehicle for their causes. This makes the Hebraists and Yiddishists of 1917 to 1919 practically unique among nationalist intelligentsias, who have usually seen literature as a means of making the nation, rather than an art of individual expression. The Hebrew literary critic Natan Grinblat, for example, pronounced that "poems written ‘in honor of the land of Israel’ could not be considered by any serious ‘lover of poetry and person of good taste … as poems at all.’" Yet as Moss points out, Grinblat was hardly an apolitical aesthete. He "was an active member of the socialist Poale Tsion party who had even spent time in tsarist jails for his revolutionary activity… and would soon leave Russia for the Yishuv." If Grinblat insisted on the freedom of art, despite his own political commitment, it was because, for Jewish culturists of his generation, only a Jewish culture that could produce the best, freest art was worth having. Such a liberal and humane attitude could not long withstand the crushing ideology of Bolshevism. As the Communists consolidated their power, first in Russia and then in Ukraine, they compelled the culturists to fall in line--and, predictably, Jewish Communists were the most unbending in Jewish matters. "By 1920-21," Moss writes, "the Hebrew cultural sphere had been for all intents and purposes destroyed." The language, with its religious and Zionist associations, was intolerable to the atheist and universalist Communists. Palestine, not Russia, would be the home of Hebrew culture from then on. Indeed, as Moss points out, the State of Israel would come close to fulfilling the culturists’ dreams of a society where Hebrew was a neutral language of expression, used for Jewish and non-Jewish subjects alike--and even by some non-Jews. With Yiddish, it was a more complicated story. The socialist affiliations of the Yiddish movement meant that the new government was willing to recognize Yiddish as the Jewish national language, and even to subsidize Yiddish schools and publications. But this support came at the price of rigid ideological conformity. Despite the Kultur-Lige’s success and popularity, its leadership was purged in 1920 and replaced by "kosher but unknown Communists," and the next year it became an official Soviet organization. There would be no room in the Soviet Union for Jewish civil society or cultural freedom, and while Moss does not follow the story to the end, the fate of Yiddish writers under Stalin is well known. David Bergelson, Peretz Markish, and David Hofshteyn, three of the figures at the center of Moss’s book, were among the Yiddish writers executed en masse by Stalin in 1952. By then, the "renaissance" of 1917 to 1919 had long been exposed as a false dawn; but as Moss shows, it is a moment that deserves to be remembered. Adam Kirsch is a senior editor at The New Republic. This piece originally appeared in Tablet Magazine.